I have a tree on Ancestry.com (Sheehan/Rudden). I live in Maine, USA and visited Cavan and walked in the footpath of my Rudden ancestors in Coolcanadus, near Cootehill. You are welcome to view my tree. When and where is the next ‘gathering’? One is ‘tentatively’ being planned in the US in 2015…we will keep you informed. Although if there was sufficient interest in the UK for an event we would certainly consider this as well! 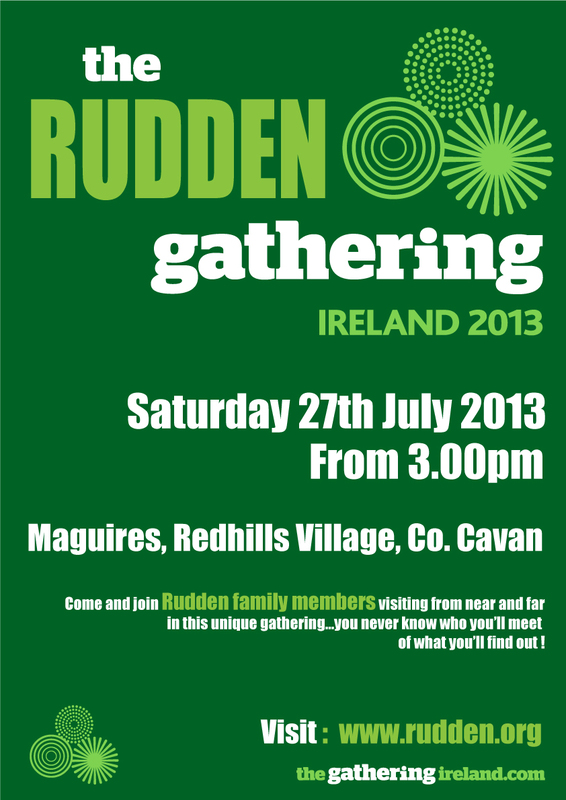 Remember, you can to follow the ‘Calling all Rudden’s’ page on Facebook for the most up to date information. I am visiting Ireland this May, 2014; will be in County Cork, early May. 5/13, 1909 from Queenstown , Irelabd. If anyone is alive would love to visit when in Cork, to pass on stories/history. visiting Galway, Killarney, Cork, Kilkenny and Dublin.